Back in October I read a post about CogHead from Guy Kawasaki, the author of the best seller book "The Art of the Start". Other similar solutions: FormBuilder from FormAssembly LLC and InfoPath from Microsoft. FormAssembly doesn't seems to go as far as CogHead. Although very powerful, InfoPath is still limited in its capacity to deploy rich internet applications, even in its latest 2007 incarnation. I'm eager to be able to play with CogHead! Note: I don't have any benefits derived from any of the aforementioned products or companies. A few days ago I read about the skills to look for in a web analytics manager. Early in my career I read a book called “Becoming a technical leader”, by Ken Orr, where he highlighted the skills of a good leader, but also the fact that not everyone can/should follow what appears to be a natural path to management, and would be better off becoming a “guru” in their field of technical expertise. He highlights that "Innovation", "Motivation", and "Organization" are the three key components of being a technical leader. Between 1994-1999 I worked for Softimage, at that time a wholly owned subsidiary of Microsoft. I was hired to put the anti-piracy mechanism into high-end 3D animation softwares used in special effects found in movies and games, but I was also the "webmaster" of softimage.com (check out how the site looked in 1997! The Wayback machine is soooo useful!). And he went on to explain that if the boss is really good, he will get a promotion and you will take his job. On the other hand, if he is a complete idiot, he will get fired and you will still get his job! I first noticed the tag game on Avinash Kaushik's blog and honestly, I was secretly hoping someone would tag me! Today I was tagged by June Li from ClickInsight. A nice idea that started way back and is getting crazy all over the blogosphere. The idea is simple: part viral, part social, when you get tagged you're supposed to reveal five things about yourself, and pass the tag along to five other bloggers. For about 2 years I was a first responder in my community, the nice town of Bromont in Quebec's Eastern Township region. Ski, snowboard and mountain bike accidents were common, even occasional horseback. From minor injuries to deadly car accidents. The call that changed my life came when I went for cardiac problems just a few houses away, on the same street were I lived. 42 years old, first heart attack, was known to work long hours. Father of two, a 15 years old daughter and a 10 years old son who was sleeping upstairs and woke up in the morning without a father. One of my own son's friend. I was taking the men's heartbeat, then it stoped, we were there, we did everything we could, including use of AED (Automatic External Defibrillator). He was confirmed dead at the hospital. I still remember every second of it, every sound, every smell... every cry from his wife. That night, I hold my wife and kids in my arms in a very different way. When I want to completely disconnect from web analytics, from the job and the little annoying things in life, I get away at our camp. 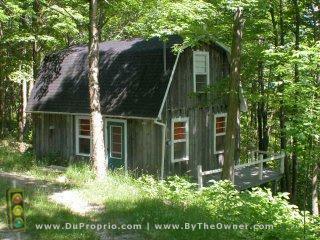 No phone, no television, no Internet and no one around. In high school I had weak results, so university was out of reach for me. I graduated with a college degree in computing in 1997. In 2003 I skipped the bachelor degree and started an eBusiness MBA. I now figure on the honor roll with a cumulative average of 94%. Since I like thinking about the Internet and its impacts on our social behavior, this tag game is very interesting. Notice the ratio of female to male, could it be that females are more inclined to play this kind of game? Getting closer to me, the background is more web analytics, then marketing, up to the early root where people profiles are more book writers and authors. Web analytics expert Avinash Kaushik goes beyond web analytics concepts and definitions to provide a step-by-step guide to implementing a successful web analytics strategy. His revolutionary approach to web analytics challenges prevalent thinking about the field and guides readers, step-by-step, to a solution that will provide truly informed and actionable insights. I was surprised there was no word about it on Avinash's site, and no traces on the Yahoo! Discussion Group. I thought I had stumbled on a little hidden secret, so I posted to my blog immediately. I got a very nice email from Avinash a few hours later kindly asking to keep it "low profile" about his upcoming book. In his own words, he said "This might sound a bit kooky but I am trying to keep the book a secret". Of course, I have the highest respect for Avinash so I removed my post, up until someone elses posted about it on the Yahoo Group yesterday. A lot of people in the web analytics field suggested, asked, pleaded for a book from Avinash! I'm sure this will be a delight to read. WASP v0.2 has been released on February 3rd. In Firefox, use View/Sidebar/WASP to display it. This version of WASP is as an early beta release aimed at web analytics implementation specialists for evaluation and feedback. Although some features and aesthetic elements are missing, no major bugs were identified (i.e. your browser shouldn't be slowed down or crash...). Your feedback is highly valuable and appreciated! Please post a comment for new feature requests. Use a different accelerator than Ctrl-W to toggle the sidebar display... Ctrl-W is used for closing Windows! Please post a comment if you discover new bugs. Some credits goes to the following people for their inspiration or simply helping me out with some bugs! WAVcheck, from Webbanalys, extends on the same idea with an executable version which can detect up to 27 different vendors. Rahul Revo posted on his blog a request for a Greasemonkey extension that would detect Google Analytics. Mohnsish Rao proposed a simple solution. Vendors sometimes provides their own debugging aids, usually in the form of a bookmarklet that will display the parameters being passed to their data warehouse. Some have proposed developing Unix-based scripts with grep and wget or perl but it looks to me like a pretty complex endeavors that have its own limitations. Or you could get help from your vendor or ask for a independent consultants to help you out. Maxamine is one of them. Other "complementary" solutions that might help: Watchfire WebQA is particularly good at crawling a site and looking for specific code. Fiddler or ieWatch are two useful tools for Internet Explorer. Charles is a proxy that records every communication between your browser and the Internet and will work with both MSIE and Firefox. I use a bunch of Firefox extensions to help me in my day to day Web development activities. Look for FireBug, Live HTTP Headers, View Dependencies and Web Developer and View Cookies. AlertSite recently posted a Firefox extension named DejaClick. Not only is this extension wonderful as a very powerful macro recorder, but it is also one of the best packaged extension I have seen so far. So if you want to better understand your web site visitors and answer their needs based on actionable data, this group is for you! Although the discussions are likely to address local concerns and often be in french, everyone is welcome to participate. P.S. You might be tempted to ask "Why is this group named Web Metrics Quebec rather than Web Analytics Quebec?". Simply because Google, in his great wisdom, made sure we couldn't insert bad words in our Google Group name, such as the first four letters of the word "analytics"! Yesterday's WaW in Montreal went well, about a dozen people attended. Again, great discussions around the products themselves, mostly WebTrends, Omniture, HBX, Coremetrics and the inevitable Google Analytics. We also talked about the pricing structure for our Canadian/Québec market, difficulty of getting management buy in (quick win approach seemed the most frequent) and lack of professional resources. Those seems to be recurring topics everywhere! We talked about organizing a thematic day on web analytics where we would present local case studies and try to get some vendors to present. Our local market is so small that we would have to piggy back on another event and include usability, design, web development in general, etc. Kind of a mini eMetrics summit... that would require much more organization than the WaW! Thou shall erase my data: Don’t keep data any longer than you have to; you can’t give up what you don’t have. Keep my information to thyself: Require customers to opt-in for each additional use of their information. Don't judge me: Never create a profiling system that labels your customers in a way that you’d have trouble justifying if they ever saw their file, because some day they probably will. Protect my data like it were thine own: Provide the best computer security that you can afford. I am who I say I am: Let your customers pick their own demographics. Don't humiliate me: Avoid embarrassing your customers by mishandling their data. Some of those points really focus on corporate employees, while others could be applied to anonymous data, and some are really closely tied to personal information management. Laws make poor privacy guidelines. Business people need better directions when navigating their customer relationships than simply to be told to steer around legal roadblocks. Boardroom discussions should be less about what is permissible and prohibited and more about what is positive and proactive—in short, what is ethical. The question should not be “Can we do this?” but “Should we do this?” “What’s the right thing to do?” If your company handles the electronic representation of the customer the way that they’d deal with them if they were standing face-to-face, you’ll do fine. It is more a general view on privacy and anonymity not specific to web analytics, however, there are some good tidbits in the complete article (plus, the ChangeThis format is fantastic, check it out if you never had the chance before!). The heat is on again: an activist group is asking the US Federal Trade Commission to investigate the use of personal information, which, in my view, is already well governed by existing laws not only in the US, but in most countries, including Canada. The problem is this group mixes personally identified data collection and includes web analytics and anonymous data collection in the same bag. The Web Analytics blogosphere is likely to have passionate views in regard to this opinion. So far, one of the most interesting post comes from the Web Analytics Yahoo group. The argument is simple, evident, and clearly expressed: there is already a user consent for anonymous data collection covered by privacy policies posted on any serious web site. It is worth to note these principles not only covers the collection of personal information, but also applies to anonymous information as well. We have to admit, however, the law is not strongly enforced. Still, those who try to comply have found it reasonable and it doesn't impact the ability to use web analytics tools to better understand their user audience and preferences. P.S. Note the province of Quebec is governed by a similar act named "An Act respecting the protection of personal information in the private sector"
In general, people don't optimize their website for non-USA traffic. It never crosses many people's mind. Why would it? Who else would be looking for your site, anyway? I find it a bit surprising there are still people who don't optimize with internationalization in mind. Unless you offer a very narrow and local content or service, I think international visitors should always be granted with respect. If you don't want or can't support international visitors (because of commercial or logistic constraints), that's fine, but let them know as soon as possible! Here in Quebec we are very sensitive and accustomed to this reality: we speak french while being surrounded by english culture. How many times to we end up on sites offering a french version assuming we are in France? How many times do we end up on a site to be abruptly abandoned after many promising steps to finally reach the lethal questions: state and zip code. Sorry "canadian", your "persona non grata". All things being equal, notions like "foreign" and "overseas" don't make much sense anymore... we're all a bit "foreign" and, well, we're certainly all "overseas" somehow! Update, Novembre 6th: This post has been updated to reflect some comments following its post to Digg, shown as one of the top stories under Tech Industry News. The source: A small note on MarketingPilgrim refers to the Boston Globe own reference to Fred Wilson's summary of an HipMojo blog post entitled "Google To Boast Larger Market Capitalization than Microsoft in 2010" (wow! talk about blogs and cross-pollination!) stating in a very prophetic tone that at the actual rate, Google will have a larger market cap than Microsoft by 2010. 1960-80, The Hardware era: In the 60s, IBM ruled the computing world with their hardware. Naturally, they also provided the operating system and most applications. 1980-94, The OS era: The 80s clearly brought Microsoft to the forefront. They didn't bother about the hardware (I remember running MS DOS and Microsoft Flight Simulator v1.0 to "certify" the machine was truly an IBM PC compatible clone). Quickly, Microsoft took the realm of the applications running on their OS, and in mid 90s the infamous "The Internet Tidal Wave" memo turned over Microsoft attention toward the Internet. See the two part article from BusinessWeek on the topic: "Inside Microsoft" part1 and part2. Microsoft was challenged by newcomers such as Netscape. Clearly, OS is not important anymore: applications are. 1994-2001, The Big Extinction: Then eBay, Yahoo! and Amazon grew up to Internet mega-star levels. This period was also the era that ended abruptly in 2001: the Internet bubble. Extremes, chaos, broken dreams... but also lots of innovation. Many didn't survive, a some passed beyond the extinction point and fewer stand-up today. Now what? We care less about applications, more about connectivity (it's all about the hyperlink model) and access to information and services. 1998- ,The Information Age: Google's mission "to organize the world's information and make it universally accessible and useful" is becoming a reality. First, a web search engine, than news, images, books, maps, database, payment, and recently, videos from the rising star YouTube and while being at it, why not bring some softwares to make it easier to control the information: Blogger, Picasa, Writely (now Google Docs) and Spreadsheet, and a lot more. Do we care about hardware, OS's and applications? Much less than before! Architecture of participation and democracy: I'm a human being, not a cookie. Richer user experience: if I can use it online without hassle, why install a software? Social network aspects: "the power of many"
Could the next wave be the ultimate democratization of information and software? We can think about Wikipedia and FLOSS. Those would be long dead based on past financial criteria, yet they are gaining enough momentum to exist as new economical model examples; they are largely based on the concept of "attention economy". Can Google succeed as an innovative company? When a company raises to the point of becoming a religious icon, there is always room for heated debates. Proponents of both all horizons refer to "stolen" innovations and "takeovers". Although they didn't invent the remedy to heal cancer, both companies often innovates in their own ways by repackaging existing technologies into new, easier and better products. In this respect, Google seems to have a cultural advantage over Microsoft. Microsoft is much more "mature" than Google. So are IBM, Oracle and Apple. Remember at one point IBM had cash flow, market cap, sales force, consulting services, everything Microsoft have today, yet, depending on the financial indicators, IBM has been shadowed by all the companies mentioned above. If you speak fluent "finance", read carefully the original article from HipMojo and you will understand the mathematical aspect of revenues, profits and P/E. That's one interesting point of view and a very well articulated post! The example above highlights Google Trends view, which is based on the search frequency of Microsoft and Google. Other tools can be used to get similar insights: BlogPulse by Nielsen looks at blog buzz for up to 6 months. Still, the trend is there: check out Microsoft, Google and Apple. Do you think Google will surpass Microsoft? Google innovates again with the possibility of creating your own specialized Google search, and this can be done cooperatively. My first shot at it, of course, is to create a Web Analytics specialized search engine where all solution and service providers would be presented, along with specialists and practitioners in the field. and uploading annotations easily built with Google Marker (trough OPML or XML format). Important! If you want to collaborate to enhance and extend this specialized search, send me a quick email (shamel67(at)gmail.com) or create a profile (provide your URL) so I know who you are. Otherwise your collaboration request will be rejected! When adding new sites, be careful to use only the most meaningful URL. That is, avoid putting "http" (useless) and specify "www" only if it makes a difference, such as "www.iperceptions.com" vs " blog.iperceptions.com"
Surprisingly, there is actually very little stats you can get to know if your search engine is being used or not. I would expect some Google Analytics hooked up to it. M. Mohamed Kahlain, un collègue de travail et stratège chez Desjardins.com, participera bientôt à un déjeuner-causerie qui traitera du Web 2.0. Certains experts ne jurent que par le Web 2.0 qui, par sa nature, influencerait les modèles d'affaires. Certains autres mettent en doute ce concept et attendent toujours de voir les retombées d'affaires de ce « buzzword ». Deux stratégistes Web s'affronteront dans un débat afin de savoir si oui ou non le Web 2.0 est une avenue prometteuse pour les retombées commerciales de nos entreprises. Venez donc entendre Michel Leblanc, associé principal chez Analyweb, blogueur réputé sur les sujets du web 2.0 et du marketing 2.0 et Mohamed Kahlain, stratège internet de la Fédération des Caisses Desjardins et scéptique convaincu de l'inutilité du Web 2.0 dans un contexte d'affaires. Qui a raison ? Qui a tort ? La réponse pourrait vous ouvrir des perspectives nouvelles! J'aurais bien aimé participer à cette rencontre, mais mon horaire et la distance ne me le permettent pas. Comment pallier à cette contrainte de temps et d'espace? En parler sur mon blog, dans un premier temps, et qui sait, peut-être que quelqu'un pourra l'enregistrer et la publier sur YouTube? Peut-être même que l'expression de mon opinion résultera en une discussion et au plus grand partage de nos opinions respectives, et ce, pour le bénéfice de tous ceux qui s'y intéressent? Espace, temps, opinion, communication... voilà l'essence des principes du Web 2.0! YouTube is a popular free video sharing web site which lets users upload, view, and share video clips. Je crois qu'il y a une distinction à faire entre certains concepts qui sont associés au Web 2.0 (ou Enterprise 2.0!?) et l'espèce de vague de folie qui rappelle l'ère de la bulle Internet. "Network as a platform": les concepts de "mashups" sont une concrétisation de l'impartition et de la spécialisation des services. Ceci permet en retour de se concentrer sur notre expertise d'entreprise ("core business"). Mon message précédent au sujet de MotionBased est une concrétisation d'une innovation qui n'aurait pas été possible sans le Web 2.0. Plateforme participative et démocratique: les technologies du Web 2.0 permettent de s'exprimer plus facilement, pour le meilleur et pour le pire, avec tout ce qu'il y a de positif et de plus noir chez l'Homme. Interfaces riches et conviviales: il a été démontré depuis longtemps que la richesse et la qualité de l'expérience usager contribue à l'atteinte des objectifs d'affaires. Mais pour ma part, j'aime plutôt me placer dans la perspective "utilisateur": la qualité et la richesse de l'interface facilitent l'atteinte de mes objectifs. Je crois que tout comme les concepts de "ebusiness", qui ont d'abord été perçus comme des recettes miracles et une panacée, le Web 2.0 évoluera au niveau d'une intégration normale et toute simple au coeur de nos vies et de nos entreprises. Le Web 2.0 est une évolution logique (et non une révolution!) qui s'exprime actuellement à travers l'expérimentation, l'innovation, une part de chaos et d'improvisation, mais qui contribuera ultimement à l'évolution des modèles d'affaires et influencera nos vies. Je ne jure pas que par le Web 2.0, mais je ne peux mettre en doute que le Web 2.0 exercera, et exerce déjà, une grande influence sur nos vies. I just got an email from Aquent on behalf of the American Marketing Association inviting me to register for an upcoming webinar talking about analytics. This webinar will be presented by Prof. Thomas Davenport, a renowned authority in the field and author of one of my favorite books: The Attention Economy. Prof. Davenport wrote a paper entitled "Competing on analytics" and will soon publish a book on the same topic. Davenport, an international authority on business and marketing analytics, is the author of "Competing on Analytics", a critically-acclaimed Harvard Business Review article. While researching the article and a soon-to-be-published book of the same name, Davenport profiled over 25 early adopter organizations that now successfully compete on the basis of their analytic prowess. Beyond the broad strategies used by pioneers like Capital One, Procter & Gamble, Amazon, and the New England Patriots, he detailed the often painful tactical mistakes and missteps made along the way by these analytic leaders. In this webinar, Davenport will discuss what data-driven marketing is (and isn't), the broad strategies and specific tactics these early adopters believe were essential to their success (and what they'd do differently next time), and how marketers can be professionally successful in these tumultuous times. The webinar will be of interest to all business-to-consumer and business-to-business marketers, especially those challenged with making analytics work on a practical basis within their organizations. I believe there are strong links between web analytics and performance metrics. For example, if you experience a drop in conversion, how do you correlate that with the fact your infrastructure had some problems (performance, network, etc.)? Another perspective is to be able to do competitive analysis: monitor competitors transactions and detect changes to a single page or a transction. What I've been looking at recently are solutions such as Gomez, Keynote, Alertsite, Mercury End User Management and a bunch of other lower-end solutions (such as Site24x7 by Zoho). However, it turns out that most of the tools are made for IT people who want to monitor and establish performance baselines (response time, SSL handshake, DNS resolution, etc.) and get alerted whenever something goes wrong. I have to admit the usability of those solutions is often awkward and not too intuitive. what business tools (vs IT solutions) could be used for external end-to-end performance monitoring? what tools could be used for competitive monitoring? how to correlate infrastructure performance metrics with web analytics? Following a post about CrazyEgg on LunaMetrics blog, I decided to subscribe and give it a try on my own blog. I'm already using Google Analytics, which was a snap to install and provides good insight. Although I find GA to be missing some important features and reporting capabilities when compared to the big 3 (Omniture, WebSideStory and Coremetrics), it's enough for a personal site and furthermore, it's free. Provides a list of the clicked objects (text links or images) and number of clicks, the most basic information. While GA will tell you about the destination page name (the TITLE tag), CrazyEgg uses the link text itself, which can provide useful insight if your page have multiple links to the same destination, both uses different wordings. Neat color-coded overlay of link clicks. Already more revealing. Probably the coolest feature: contrary to simple click map overlays, a heat map tells you exactly where people clicked. That's it, for my link "WaW in Montreal: 225% increase", we see the "heat" around the "225% increase". 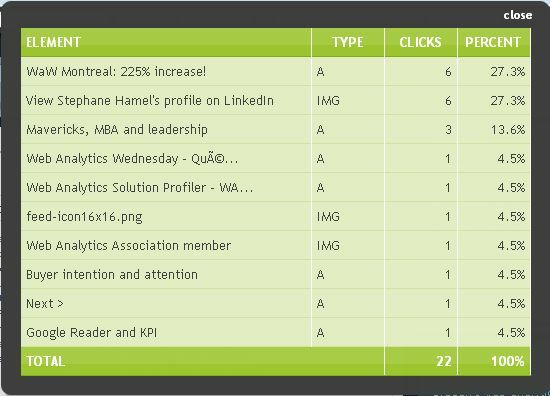 Another example is my post about "Web Analytics Wednesday - Québec", where it's clearly the word "Quebec" that was clicked. There was also some clear interest for my LinkedIn profile. Just like CrazyEgg will tell you which links are performing better on a single page, it will also tell you which of two page design works better. This is really a simplified A/B testing technique. Again, the biggest merit of CrazyEgg is to bring this technique to the mass. Blogs are often composed of other scriptlets or gadgets. In most cases, they will take the form of a SCRIPT reference or an IFRAME. 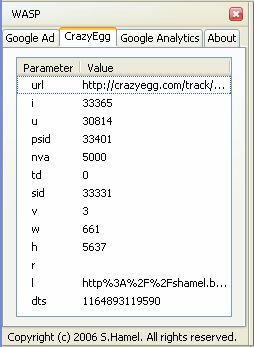 IFRAME are really pages hosted osomeone else'sss web site and thus, what happen in there (clicks and any other interactions) is really out of your control and obviously, not measured by Google Analytics, CrazyEgg or any other tools. Script embedding techniques offers more control and will generally work with analytics solutions. CrazyEgg is a simple and useful addition as a complement to any analytics solution, maybe especially bloggers using Google AnalyticsAltoughht other heat map solutions are typically expensive and a bit more complex to use, they are usually part of a planned and structured analysis process which includes analysis and skilled personnel to help you out. I would say that CrazyEgg, just like Google Analytics, increases awareness of the field of usability, design and analytics. Companies should still investigate to find the best fit for their needs.